Negotiating can be hard, but it can also be a lot of fun. My wife and I have been working hard for a long time now getting out of debt and saving up 3-6 months of emergency fund, so we’ve cut back as much spending as we could. One of the things we decided we could live without during this time was a bed. (Well, I decided I could live without a bed and managed to convince her it would be ok for awhile as well). So for the last year and a half we’ve been sleeping on a mattress on the floor. Believe me, being debt free was completely worth it. Well, now that we’ve accomplished those goals my wife has been a bit more adamant about wanting a bed, and I can’t blame her too much. So, we saved up some money and decided to go shopping for a bed yesterday. At this point in the story I’ll mention that my wife hasn’t been very good at negotiating in the past. My parents gave us some money for a couch for our wedding, but we went to pick it out. I was trying to negotiate with the salesperson for the couch we had picked out, and she was there like a kid in a toy store who just had to have that one. “Well what do you think about this one hunny?” “I want it I want it I love it this is the one let’s get it,” or something along those lines was the response. Awesome, thanks a lot. You probably just cost us $150. Oh well, you live you learn. Now we have a funny story to tell. Fast forward to this weekend, and we found a bed we really liked. 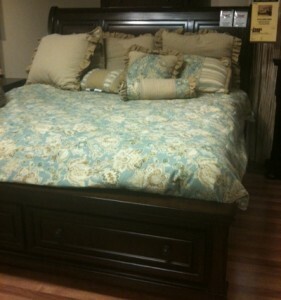 It was a nice platform bed with drawers for storage underneath. We don’t have box springs so we’d been looking for a platform bed, and the drawers seem like a nice addition since it doesn’t have the box springs getting in the way. Now, we had hoped to get a bed for less than $500 or so on craigslist, but we’d been striking out for a long time in that department. Just couldn’t seem to find anything we both liked, and when we did they were more expensive anyways. So while $500 was the target, we were willing to spend a bit more if we found something we liked. Well, we found the bed you see above, and looked at the tag. It said $1529. Ouch. No way I’m gonna spend that much. Now, I don’t ever really believe the tags at furniture stores, but I didn’t think it was going to be in the ball park of what we were willing to spend. Well, they were having a sale so I decided to at least find out how much they take for it. He started off with $1050 or so. I chuckled to myself and thought we should just leave. I told him we had hoped to spend about $500, but I realized they wouldn’t take that for a bed they marked at over $1500. I said I’d be willing to go to $700, but that was pushing it. He said, “Well I doubt that we can take that, but let me go ask.” I hate it when the guy I’m negotiating with doesn’t actually have any decision making power. Oh well. So he went to ask his boss if they could take it, and comes back and says they need another $50, or $750 total. Now that isn’t too terrible, it’s over 50% of the sticker, but I just wasn’t willing to go that high. I said I don’t think so, and he offered to split the difference at $725. I turned to my wife and asked her what she though, expecting her to say ok we’ll take it. She said, “It’s ok, we can just keep looking and find something else.” I was so proud of her. The power of being able to walk away from a deal is huge in negotiating. Now it can’t just be a tactic you try to get a better deal, you have to really being willing to walk away for it to be successful. She was perfectly willing to keep looking, we have been shopping around for months now. It was already more than I really wanted to spend, so even though I thought it was a decent deal I was fine with walking away as well. He said, “Ok, we’ll take $700 for it, let’s get some paperwork filled out.” Ah sweet success. Apparently the incident with the couch stuck with my wife. She told me afterwards that when he was coming over she was really giving herself a pep talk and she was going to make sure she didn’t appear too anxious or excited about it. She was so happy that she held strong and managed to help with the negotiation. There are a couple things to takeaway from this. First, remember “Ask and you shall receive.” Luke 11:10 says, “For everyone who asks receives; he who seeks finds; and to him who knocks, the door will be opened.” I was ready to just go to the next store based on the sticker price, but I figured it couldn’t hurt to ask. Sometimes that’s all it takes. Second, remember the power of being able to walk away from a deal. For almost everything, there is something else just like it, maybe better. There is always the chance to find a good deal on something else later. If you are willing the walk away, that gives you the upper hand in any negotiation from the beginning. Anybody else have a good negotiating story to share? If you do, let me know in the comments below, I’d love to hear about it. I’m always trying to practice and get better at negotiating. It’s a really great skill to have when trying to save money, and frankly it can be a lot of fun sometimes. This isn’t a negotiating story – but I have had success at times asking for a cash discount when I have the cash in hand. We recently got 10% off at the dentist office for paying with cash (that was over $120 off since both my husband and I had work done that day). Cash is powerful! Previous post: Get to Work! Next post: Should Baby Step 1 be More Than 1000 Dollars?